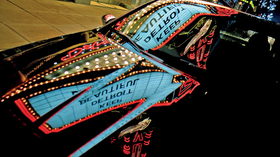 The Fox Theatre, a Detroit landmark, is reflected on a Chrysler 200 during the TV spot featuring rapper Eminem. Chrysler will launch a line of merchandise in the next few weeks to help dealers capitalize on the buzz of the gritty Super Bowl commercial and the new brand tag line, "Imported from Detroit." Ad agency Weiden+Kennedy, of "Just Do It" fame for Nike, wants to cast dealerships as "embassies" for vehicles "imported" from Detroit. "One of the things we've been working on for the last couple of days is a dealer kit," says Joe Staples, creative director for Wieden+Kennedy of Portland, Ore., which created the Super Bowl spot. "How can we make dealers around America feel like Detroit embassies? How can we put this feeling about Detroit and its optimistic resurgence in dealerships? We'll help them keep that stuff rolling." Wieden+Kennedy also will use the "Imported from Detroit" theme in regional (called Tier 2) and local (Tier 3) advertising. Aaron Allen, an agency creative director on the Chrysler account, says future advertising will talk more about the 200's attributes than the national TV (Tier 1) Super Bowl commercial did: "Tier 1 is meant to grab people's emotions and heart. With Tier 2, people want more details to include our car into their shopping considerations." Wieden+Kennedy devised the "Imported from Detroit" theme in part because Chrysler is aiming at import buyers with both the 200 and upcoming 2011 Chrysler 300 sedans. Because of his own hard-luck story, Eminem was the perfect character for a commercial about the comeback of a brand, a company, a city and an industry, Allen says. "There's a scrappiness and honesty to him that's the Detroit story. As famous as Eminem is, he's not a massive showboater," Allen says. "The culture of Detroit is one of hard work and excellence, but not one of a city that pats itself on the back." Saad Chehab, head of Chrysler brand communications, says Eminem "symbolizes the city's history, its stumble and recovery." The message from the campaign is that "you no longer have to cross oceans to get what you can have from these shores," he says. Chrysler Group CEO Sergio Marchionne helped craft the commercial, once watching rough cuts more than 100 times on a plane flight. That's unusual for the CEO of a major company, the agency execs say. Staples says: "He sits down with scripts and talks about what words are right. He's a big-picture guy, but he also understands writing." Allen says: "It surprised us from beginning of our relationship how specific he could be, in a good way."